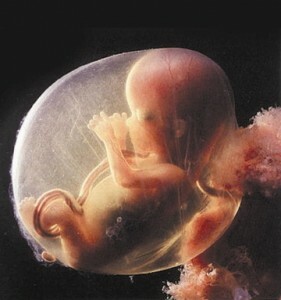 Prenatal Music and Language for Life Mostly likely, you’ve already heard about prenatal education… Maybe, you haven’t taken into consideration Teaching Your Baby Before Birth, but, believe it or not, it’s time to start thinking of it and, hopefully, time to enroll in “Mom, Dad, & Me” music and language program, designed by a certified, well-experienced early childhood educator with BAs in Piano and Languages! There is so much to tell about how the family gets bonded while teaching a yet unborn baby together.Music Lessons For Toddlers You will be re-learning about what life is about while expecting the baby’s arrival and when a new family member is already with you. Moms and Dads are welcome to enroll in this 10-week group Program, that will provide them with basic music education, such as learning how to sing nursery rhymes and accompany them on a piano/keyboard. They are going to develop a sense of rhythm, work on their pitch, master creative movements they will teach their little ones to. Because music is the language itself, they will work on teaching their babies the basic language, while teaching them melodies and rhythms. The lyrics for all the songs and sheet music will be provided. Keyboards and percussion instruments will be also provided for the class time, but practicing at home will also require the use of pianos or keyboards, which are easy to get online inexpensively. Preschool Music All the children are born with a potential to be musical. Music can lay the foundation for learning and social and emotional success. 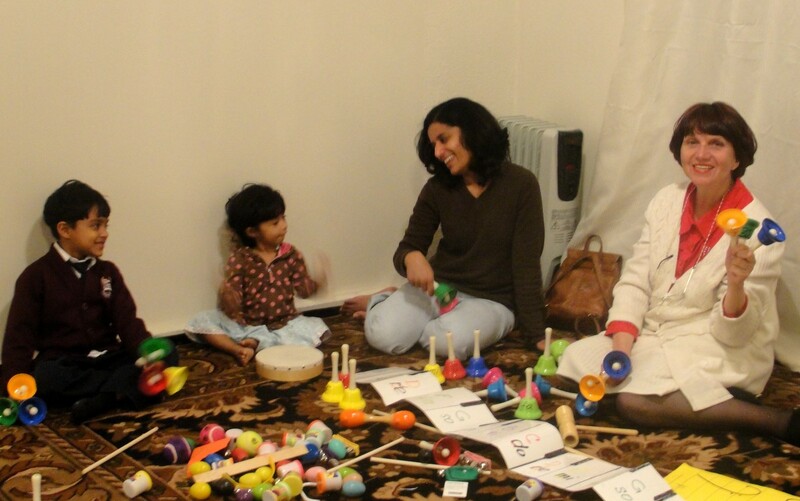 The children participating in preschool music classes learn about classical, folk, jazz and pop music by listening to the best samples of music and trying their own movements while listening. As we know, young children can only learn when playing, and their educational play is their job and their fun. Most of the songs we teach to sing and role-play are based on the richness of traditional folk music—American, Chinese, Russian, Spanish, and etc. Creative movement is included wherever it’s possible in our program. We successfully use so-called songbooks. 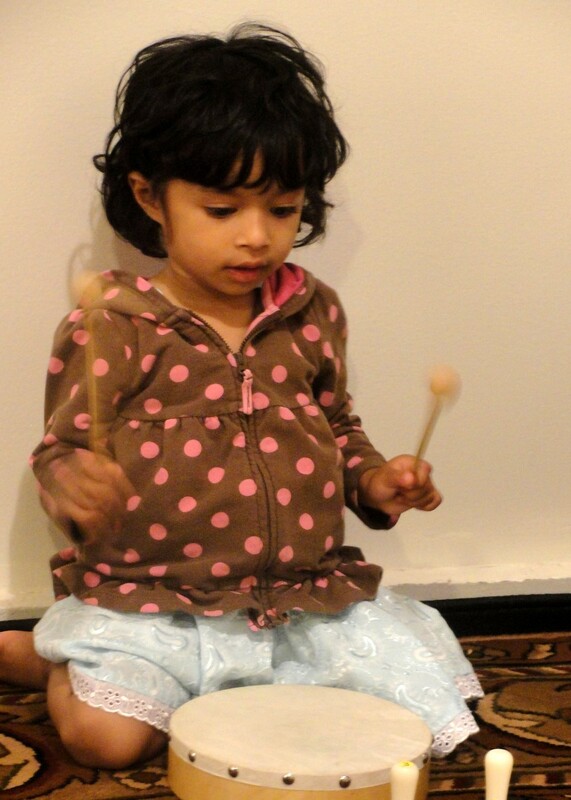 We allow time for free exploration of instrumental music, ribbons, scarves and percussion instruments. Besides well-known percussion instruments (maracas, finger cymbals, tambourines, different sorts of drums, shaker eggs), we invent our own instruments, based on familiar household items. In this way, we show that music can be found everywhere. 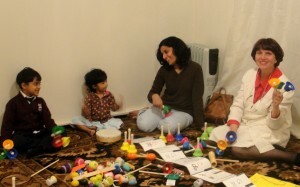 While teaching how to listen to music, to dance or move, to sing or to play percussion instruments, we supply those little ones with a huge amount of music theory, presented in a simple, playful way, so that they have a chance to memorize note values, time signatures and the pitches by constant repetitions of familiar patterns at the age of 2-3.We use tuned metal handbells and magnet boards for teaching notation, and the children love to play not only melodies but also harmonies on those bells. At the age of 3-4 they learn how to sight-read music. We introduce the basics of a keyboard and let children play on mini keyboards at the age of 2.5 or 3.